When looking to tailor solutions to client requirements, Andrews Automation Ltd is able to offer both standard and bespoke systems to handle all kinds of pallet configurations. Whether it be quarter pallets, half pallets, CHEPs, Euros, or even a pallet of bespoke design, Andrews Automation Ltd have the knowledge and experience to design, build and install a solution to suit. 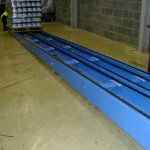 Our standard pallet conveyors are capable of transporting pallets of up to 1500kg in weight, but systems can be designed and manufactured to deal with loads well in excess of that. We are also able to design in drive maximisation with a view to minimising the number of drives required to operate the system. All control and mechanical elements of our systems are designed and built in-house by our dedicated team of design engineers. We have our own electrical bay that enables us to build PLC panels to our own high standards whilst keeping customer deadlines within our own control. Our ‘open house’ policy allows clients to visit our facility to discuss projects and see how progress is being made on their solution investments. Here at Andrews Automation Ltd, we specialise in integrated systems. 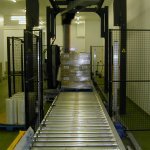 For example, we are able to provide a pallet conveyor system that could potentially incorporate powered turntable solutions, cross transfer systems, chain conveyors, pallet wrapping or pallet strapping machines, and pallet dispensers. 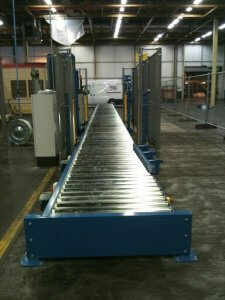 We are also able to offer robotic palletising options to take the strain out of manually palletising. A massive bonus when looking to reduce head count or Health & Safety concerns relating to Repetitive Strain complaints. All of the systems manufactured by Andrews Automation come complete with after sales back up and a 2 year parts and labour warranty. 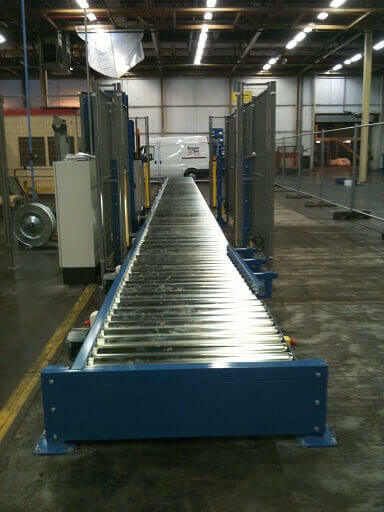 For more information on how Andrews Automation can help your business with pallet conveyors and other materials handling solutions, please call the office on 01405 768900 or email sales@andrewsautomation.com.